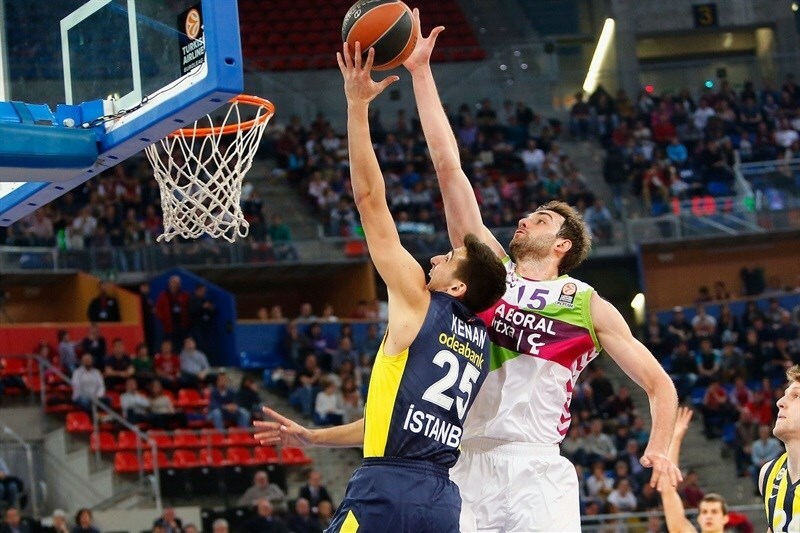 Laboral Kutxa Vitoria improved its chances to make it to the Turkish Airlines Euroleague playoffs from Top 16 Group F by downing Fenerbahce Ulker Istanbul 93-76 at home on Thursday. Laboral improved to 6-7 and is fourth in Group F, but could drop to fifth place if Anadolu Efes Istanbul beats EA7 Emporio Armani Milan on Friday. 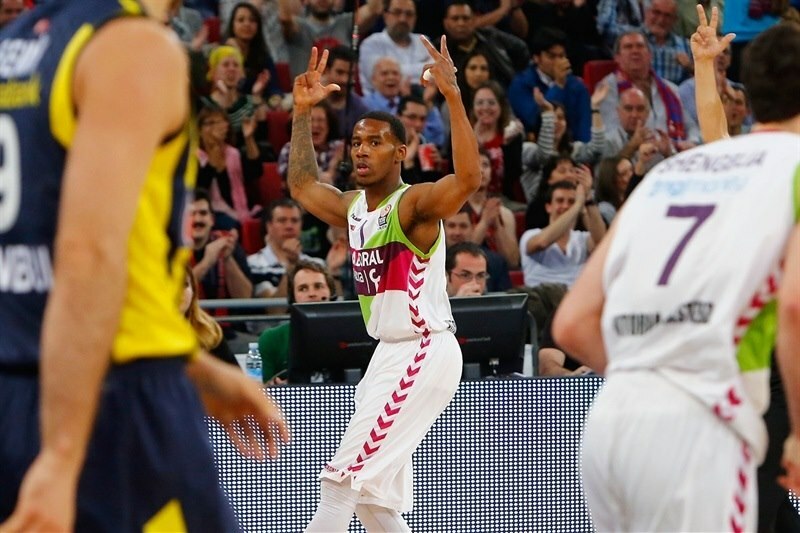 Laboral stopped Fenerbahce's nine-game road winning streak, which had stretched back to late October. Fenerbahce dropped to 10-3. 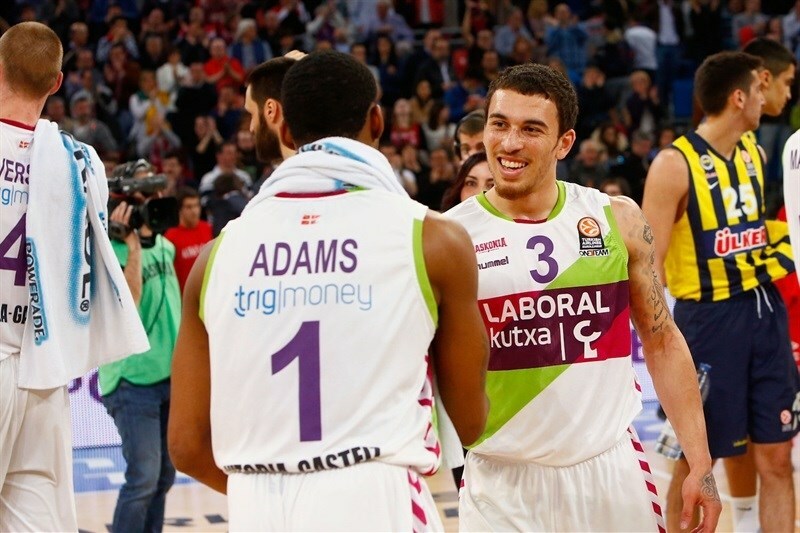 Mike James led the winners with 19 points. 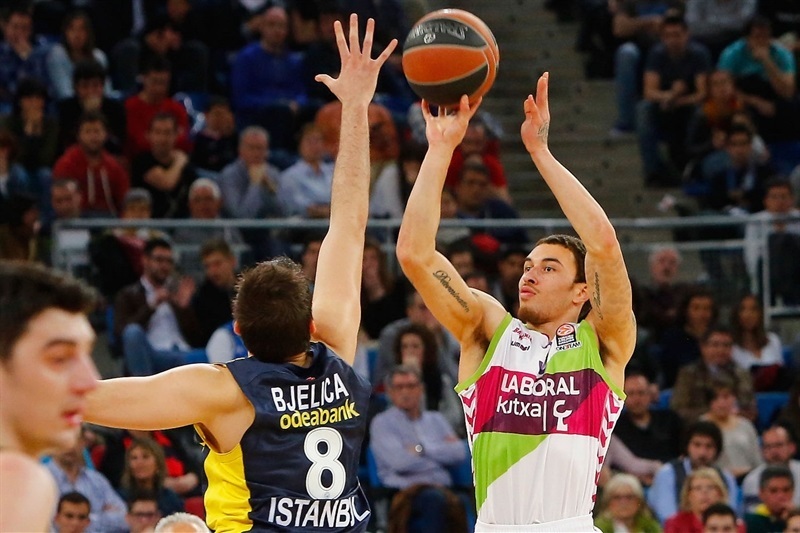 Fernando San Emeterio, Darus Adams and Fabien Causeur each scored 15 for Laboral. 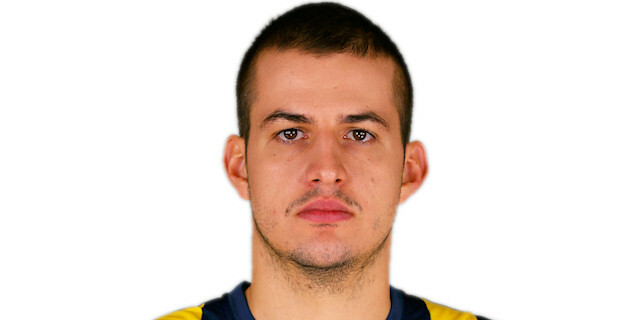 Nemanja Bjelica led Fenerbahce with 17 points and 10 rebounds. 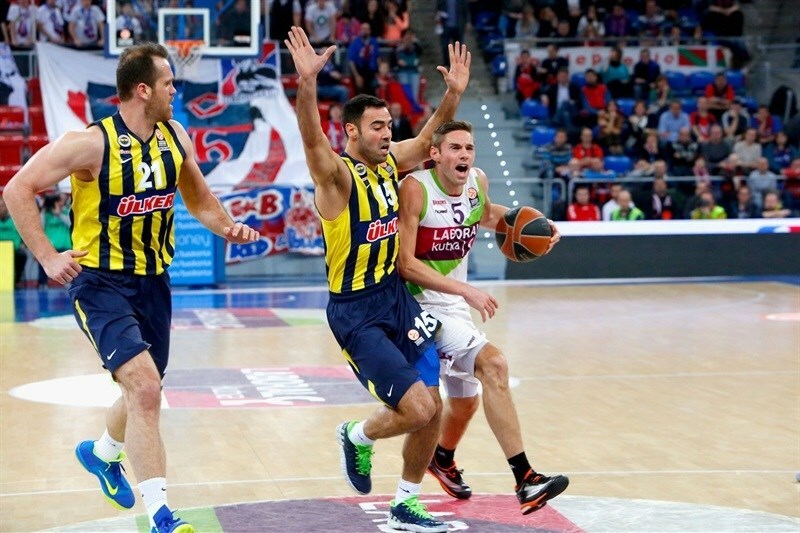 Jan Vesely added 13 points, while Bogdan Bogdanovic had 11 for the guests. A three-point play by Bjelica gave Fenerbahce an early 9-10 lead. Causeur struck twice from downtown in a 10-0 Laboral run that helped the hosts to a 21-14 edge after 10 minutes. San Emeterio followed a wild four-point play with a triple to boost the lead to 37-20 midway through the second quarter. Fenerbahce got within 42-29 at halftime and as close as 42-37 early in the second half, but Adams led another 10-0 run for a 61-47 advantage through three quarters. Laboral boosted its margin to 77-59 midway through the fourth quarter and never looked back. Causeur got Laboral going with a floating layup which Bjelica matched with a backdoor layup. Adams scored in penetration, as Fenerbahce struggled to find the right game rhythm. Bogdanovic stepped up with a corner three-pointer, but a one-handed floater by San Emeterio put Laboral back ahead, 6-5. 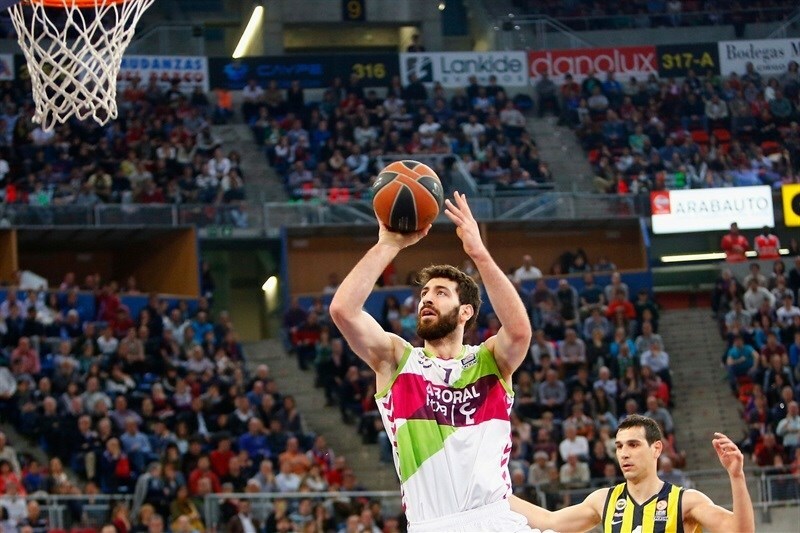 Causeur split free throws and another basket by San Emeterio boosted the hosts' lead to 9-5. Nikos Zisis found Semih Erden for a layup, which Bjelica followed with a three-point play that gave Fenerbahce its first lead, 9-10. Causeur kept pushing Laboral with back-to-back bombs from downtown, igniting a 10-0 run that Kim Tillie capped with a tip-in for a 19-10 advantage. 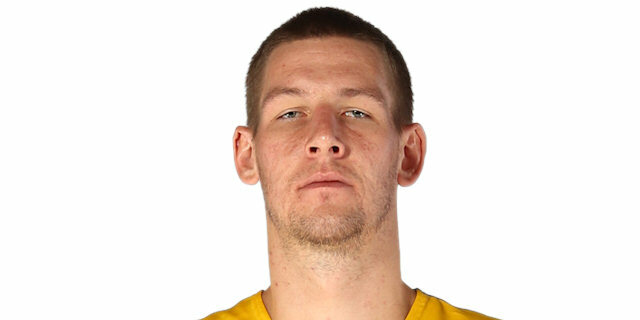 Jan Vesely shined with an alley-oop layup, which Bjelica followed with a wild coast-to-coast layup that gave Fenerbahce some fresh air at 19-14. A jump hook by Mirza Begic restored a 21-14 Laboral margin after 10 minutes. Begic sank a baseline jumper early in the quarter, which Emir Preldzic erased with a driving layup. Tillie buried his trademark five-meter jumper and a three-point play by an unstoppable Begic made it a double-digit game, 28-16. Vesely and Zisis hit free throws, as Laboral entered the foul penalty early in the quarter. Laboral started to miss open shots, but a tip-in by Tillie gave the hosts a 30-20 advantage. San Emeterio took over with a wild, off-balance triple and the free throw that came with it and soon hit another one from beyond the arc to break the game open at 37-20. Bogdanovic answered from downtown and Andrew Goudelock hit a technical free throw. Bogdanovic split foul shots and a driving basket by Zisis brought the guests within 10. Colton Iverson ignited the crowd with a huge dunk in traffic before free throws by Oguz Savas and Mike James fixed the halftime score at 42-29. Goudelock found Savas for a layup right after the break and a driving basket by Bogdanovic brought Fenerbahce within single figures at 42-33. Goudelock scored in transition and soon added a one-handed floater off a Laboral timeout to bring the guests back to life at 42-37. Adams struck from downtown and a fast break layup by Causeur restored a 10-point Laboral margin. Adams scored in transition and free throws by Iverson made it 51-37. Adams sank another triple to cap a 12-0 run. Bjelica struck from downtown and Bogdanovic swished a turnaround jumper, however a red-hot Adams hit another shot from beyond the arc. Erden hit free throws, which Adams matched with a fast break layup. Vesely scored down low and split free throws, but Tillie hit a turnaround jumper to keep Laboral way ahead, 61-47. Toko Shengelia scored around the basket early in the quarter. 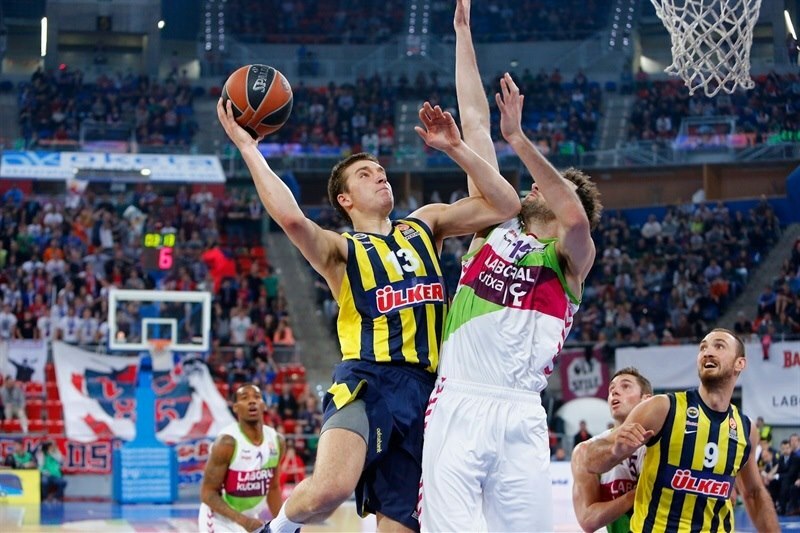 Vesely answered with a layup and a free throw by Zisis gave Fenerbahce hope at 63-50. San Emeterio nailed his trademark stop-and-pop jumper, but Vesely quickly answered with back-to-back dunks. Shengelia sank foul shots and a floater by James made it a 15-point game with over six minutes left. Savas stepped up with a layup-plus-foul, but a free throw by Shengelia and a one-handed alley-oop dunk by Iverson seemed to seal the outcome at 72-57. Causeur and Goudelock exchanged free throws and a three-pointer by James allowed over 10,000 fans at Fernando Buesa Arena to start celebrating at 77-59. Fenerbahce never gave up and kept fighting, but Laboral cruised to a critical and impressive home win. ""We had designed a game plan that was based on preventing them from getting open spaces, because they are quite good in one-on-one situations. We wanted to collapse in the paint to avoid penetrations and force them to take the ball outside. We wanted to run, never stop on defense, and I think we achieved it. I think that forcing them to commit 16 turnovers is awesome. The job we did protecting our boards in the first half was very important. We just allowed one offensive rebound after a free throw. We got in trouble in the beginning of the third quarter but we managed to overcome that thanks to our point guards scoring. That helped us break the game and face the last minutes comfortably. They didn't play at their best level, but I think we had some influence on that, too. We started the third quarter out of intensity and concentration. We needed to call a timeout because we were out of energy. I think we got back to our rhythm soon and kept following the idea of the game that we had planned. We knew that if we win in the last two games, we have chances to go to the playoffs. We can also be out because it doesn't depend on us. We did our job and will see what happens [with Efes] tomorrow. I have to congratulate my guys because of the big effort they put in and start thinking about the next game." 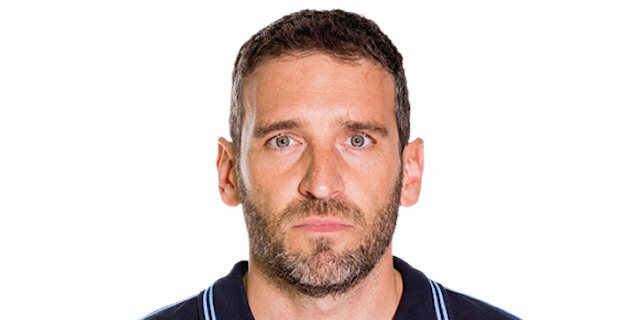 "First of all, I want to congratulate Laboral Kutxa for this win. They played a good and complete game, from the beginning to the end. They played with a great pace, with a good defense that allowed them to score a lot of fastbreak points, and that's where we lost the game tonight. We turned the ball over 10 times in the first half, and had 16 in the end. This is a game where you can lose balls, but the way we did it tonight is something difficult to understand. Every time we lost the ball they scored in transition with ease. Let's see what happens in the last week, because we still have chances to lead the group. We started preparing this game on Monday, and I said to my players that what we did so far was useless, that we needed our best to win tonight, and it proved right. We must change some things, we played without energy, slow on offense, without giving help on defense. If my important players play like this in the following games, we will have a tough time." "We know we have a great team and that we can play like this, so we tried to give everything we had to win this game. Today, we just passed the ball well, we focused on that in practices. It's a matter of making the right passes, not forcing anything. Tonight, we took care of the ball and it was a huge thing, and helped us build our lead in the first half. We are playing at a good level now, but we just want to get better and make the playoffs, something we can achieve. So that's our focus right now." 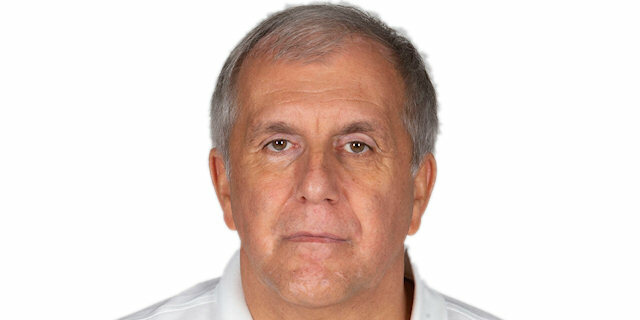 "We didn't expect to lose this game by such big difference, but they are an excellent team. They have real chances to make it to the playoffs, and they proved it tonight. I want to congratulate them for this win and wish them good luck. It's difficult to lose a game like this, with this difference, but sometimes it's not bad in the end as it makes you keep on your toes, not losing ground. We just need to forget this game and recover for our next game in the Turkish competition, then get ready for the last Top 16 game against Anadolu Efes."